Pulse the almond flour and confectioners’ sugar until very fine. Add cream of tartar. Note: almond flour and almond powder are not exactly the same thing. Almond flour, which is easily found in the US, is a bit too coarse to make a macaron, and so it’s best to pulse almond flour in a food processor until it is very fine, before continuing with the recipe. Whisk the egg whites until firm peaks are formed. Add granulated sugar and whisk another few minutes. Fold the egg whites into sugar and almond powder until well incorporated. Using a pastry bag with a plain round tip, pipe one-inch rounds on to a silicon baking mat. Preheat oven to 250 degrees. Bake for 30 minutes. Bring the milk and vanilla seeds to boil. In a bowl, mix the egg yolks and sugar until pale and fluffy. Add flour and mix again. Pour the warm milk over mixture and mix well. Cook at moderate heat, and stir, for about 10 minutes. Chill. Place mixture in a mixing bowl, add the butter and whisk until creamy texture. 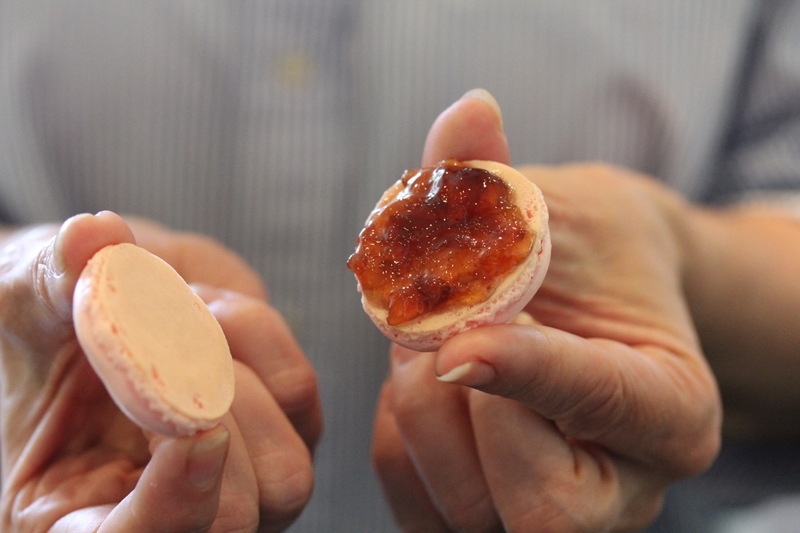 Spread the bottom of a macaron with the filling, then attach to the bottom of another. Et voila! We added a few drops of food coloring to the rose macarons, along with a half teaspoon of rose syrup, to achieve the color and flavor of roses.